* 2.75″ (70mm) Stainless steel stem. * Temperature: -40 to 392°F (-40 to 200°C). * MAX/MIN recall of high and low temperatures. * Data Hold and Auto power Off features. * ±2°F/1°C accuracy, 0.1°/1° resolution. 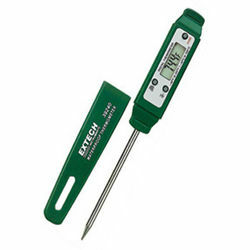 Pocket thermometer with stainless steel stem * 2.75″ (70mm) Stainless steel stem. * Temperature: -40 to 392°F (-40 to 200°C). * MAX/MIN recall of high and low temperatures. * Data Hold and Auto power Off features. * ±2°F/1°C accuracy, 0.1°/1° resolution. * A Quality product from Extech, USA.